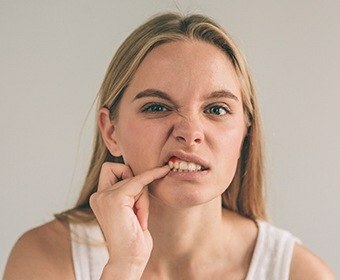 It’s the most common dental issue in the entire world, and about 50% of the US adult population currently has a form of it, according to the CDC. It’s one of the leading causes of adult tooth loss. It’s been shown to have a strong connection to other whole-body problems, such as heart attack, stroke, and diabetes. Needless to say, we take gum health very seriously here at ProSmiles, which is why if you’re experiencing any redness, swelling, or sensitivity in your gums, we recommend you give us a call today to get the treatment you need! Why Choose Us for Gum Disease Treatment? The primary source of gum disease is the same as cavities: plaque. When plaque is allowed to build up along the gum line, this exposes the soft tissues of the mouth to bacteria, which can cause inflammation and damage. Typically, a lack of oral hygiene, tobacco use, or a genetic predisposition can all lead someone to develop gum disease. 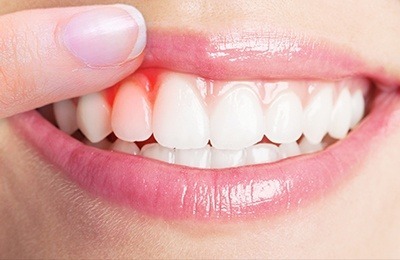 Regular brushing, flossing, and dental visits can often prevent this infection, but for patients who develop it, targeted care is absolutely necessary to keep it from significantly harming the smile. 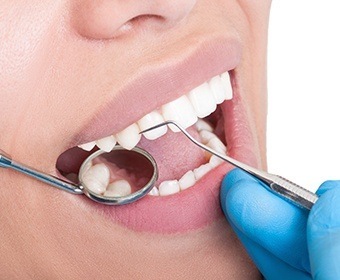 Whenever you come in for a checkup and cleaning, we will carefully examine your teeth and your gums. They should always be a healthy pink color, but if we notice any redness or swelling, we’ll know that a patient might have early-stage gum disease. If you notice any of these on a regular basis, this is a clear sign that you have a gum infection and should come see us right away. For patients dealing with gum disease, our first order of treatment will involve removing the damaging plaque and bacteria from along the gum line, which we’ll do using a procedure called scaling and root planing. Think of it as a dental cleaning that is solely focused on your gums and the roots of your teeth. Once we’ve broken up all of the plaque deposits, we’ll smooth out the roots of the teeth so plaque is less likely to gather around the gums and cause an infection in the future. Infectious bacteria often like to accumulate in the small spaces located between the teeth and gums, which are called periodontal pockets. These can grow as an infection advances, putting some bacteria beyond the reach of a regular teeth cleaning. 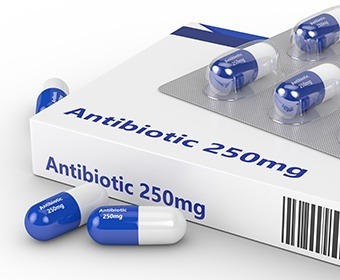 By applying a topical antibiotic to the gums, however, we can kill these well-hidden bacteria and restore a patient’s oral health. Afterward, we’ll recommend that a patient come to see us more regularly for dental cleanings to prevent reinfection.